A PIC 12F675 Tutorial Including 7 Projects you can Easily Build Yourself. A tutorial on the 12F675 PIC microcontroller which shows you how to program and use it with a series of projects starting out with a simple LED flasher and progressing on to more advanced projects. Although the 12F675 is an older device it is still a useful one and has many peripehrals built into it including the standard 10bit ADC. In fact it has two timers and analogue comparator and the ADC which can read analogue values from 4 pins. With its 1k of programming memory you can make this device do many different tasks. 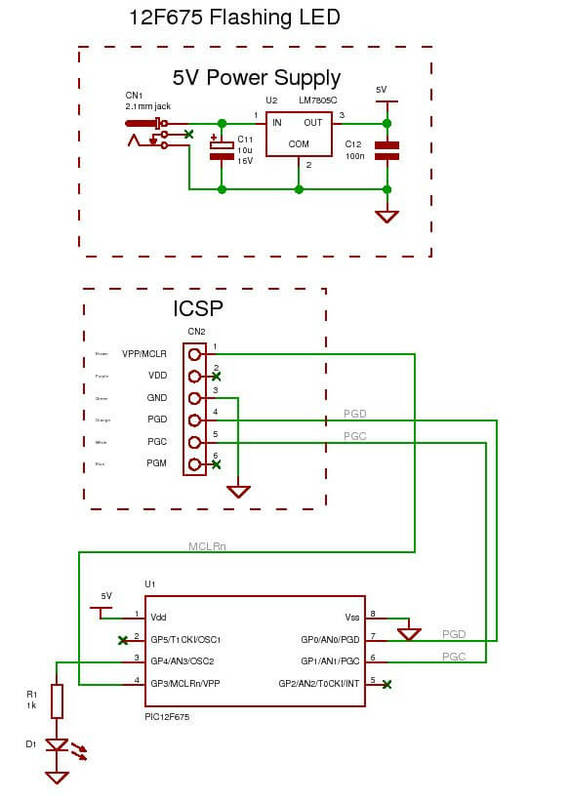 To use the tutorial files you need to have a PIC programmer with an ICSP output connector and the components shown in each tutorial. You don't have to install the compiler as hex file is contained in the downloadable zip file. If you do want to re-compile the source code the compiler is free for the small amounts of code used here as they all generate hex output files that are below the 2k limit. Note: Observe static handling precautions when picking up the chip. Programming with PIC ICSP (In Circuit Serial Programming). PIC ICSP signals and 'real' circuit. General purpose ICSP programmer circuit. MikroC compiler Click Here for the compiler download page. Quick guide to compiling programs with MikroC. The 12F675 microcontroller is packaged in an 8 pin chip and even though it is tiny it is packed with peripherals. It even has a 10bit ADC built in (this is the same ADC that you can find on the 16F877A and 16F88 used elsewhere on this site). So learning about this peripheral is also useful for these other parts. 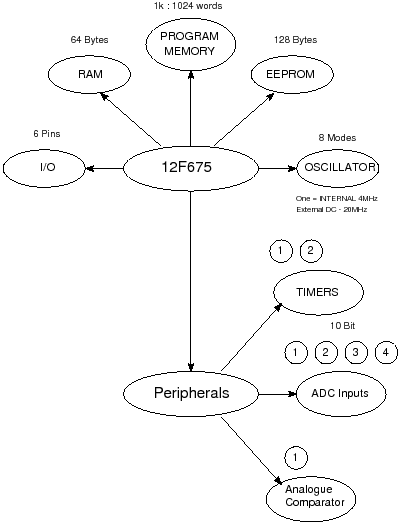 The 12F675 has 1024 words of program memory, 64 Bytes of RAM and 128 Bytes of EEPROM, an internal oscillator, timers an ADC and a comparator. Note:The 12F629 is identical except that it does not have the ADC. TIP: If you need a bit more memory consider using the 12F683 as this has twice the memory (2048 Flash words,128 Bytes SRAM and 256 Bytes EEPROM) compared to the 12F675. The 12F683 additionally has a PWM module and an extra 8 bit timer compared to the 12F675. The 12F683 also has an 8MHz internal oscillator( 12F675 has 4MHz). >br> Note: you can compare this chip (using bubble diagrams) to some others used on this site by clicking here. 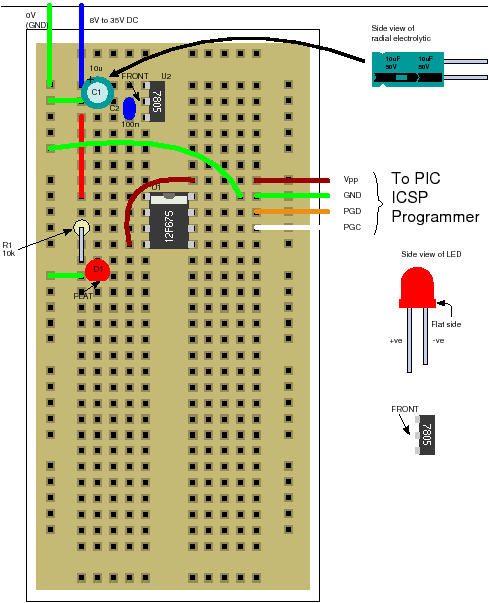 You can program the microcontroller using an ICSP programmer (you can use it for any PIC chip). ICSP connections are shown in the diagram below. You can find a programmer circuit here and information on using ICPROG here. Note: Using the above programmer circuit sometimes you need to remove the ICSP connector (this is easier than removing the whole chip). I have used a 4 pin molex with wires soldered to the base (these go into the solderless breadboard) making removal trivial. Sometimes you need to remove it as the programmer does not release Vpp (PC software operation) and at other times you will need to remove it as you will want to read the analogue voltage at the ICSP pin (see temperature logger in a further tutorial). If you don't have a bench power supply then you should use the following standard circuit. All you will need is a wall power supply block with dc output (greater than 8V and no more than 35V) or a 9V battery to plug into CN1. Note: It is best to use the 5V power supply circuit as it not only correctly regulates the dc voltage but it protects your PIC chip. The input voltage can go up to 35V without damaging the 7805. You would not want to use that high voltage for very long if using reasonable current as the 7805 would have to get rid of the excess power as heat. Say you used 100mA dropping 35V to 5V gives P=VxI = 30 *0.1 = 3W - a huge power output - the 7805 would get very hot and go into thermal shutdown! See this page for procedure on 12F675 calibration. 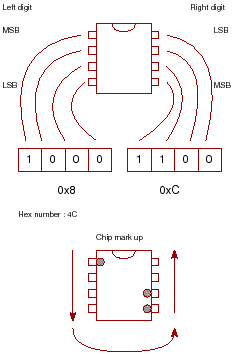 Before Programming it with your hex file make a note of the oscillator calibration value which is factory set by Microchip. This value calibrates the 4MHz oscillator to 1%. If overwritten you have to re-calculate it yourself. Click here for m ore detailed information (in a further tutorial) and then come back here. If you use ICPROG then it warns you that you are about to overwrite the oscillator calibration value and asks if you use the value from the hex file - you should answer No to keep the original value. Note: Each oscillator calibration value will be different so you have to note down each value for each chip and not muddle them up! If you loose it you can recalculate it but you will need a frequency counter. TIP: This page (12F675 OCSCAL calibration) shows you how to calibrate the 12F675 using a frequency counter, a PICkit3 and some code running in the 12F675. This is a tip I have seen on the web for storing your calibration value on the device itself - it's so good I thought I would include it here. All you need is the last hex number as the 1st is always 34. So lets say you read your device and get 348C. Just use the 8C part. As with the 16F88 the 12F675 microcontroller has eight oscillator modes but unlike the 16F88 the internal oscillator is fixed at 4Mhz. You can use an external oscillator either a resistor capacitor pair, an external clock signal or a crystal (or resonator). You can even operate the crystal to 20Mhz if you need extra performance. Note: Only use the external modes if absolutely necessary as you loose the use of pins (loosing 2 out of 6 I/O pins is a lot to loose). The first program is a flashing LED - it always is! The reason is that there is the least hardware to go wrong so it gives a good test of your system setup. This project also uses the 12F675's internal oscillator and you don't need a crystal so there is even less to go wrong! Note: Double check your connections on the breadboard. Note: the plus sign on the 10u electrolytic capacitor which must connect to the positive input voltage and have a voltage rating stamped on it of greater than 35V (or greater than your maximum dc power block output). The LED must be connected with the flat side to ground. The following diagram shows the above Plugblock circuit in schematic form. It is exactly the same circuit but lets you view the circuit in an easier way and shows the layout of the circuit from the point of view of the circuit block functions rather than how you have to place the components (using the Plugblock). Note: The LED current limiter resistor (1k) is not the ideal one it just lets you see the led (you don't need the maximum current to see the light from the LED) - to use the LED at higher output replace it with 220R. This gives lots more current so it is brighter I=(5-2)/220=13mA (most leds let you use 20mA but you would have to check the forward diode drop, here assumed as 2V, to get the exact resistor. It's only an LED I always assume 2V as the slight variations for different colored LEDs won't make much difference. Using ICPROG (you can find a description of how to use it here) set the device to 12F675 and hit the read button. Remember to note down the contents of address 0x3FF. The next thing to do is to flash the LED to prove that the system you have is working as reading back data is not very interesting. You can use the hex file directly to program the 12F675 then it will flash the led on and off or you can re-compile the files using the free compiler from Mikroelectronika. You can find a very brief compiler tutorial here. First of all the init_ports() routine sets up the direction of pins in the GPIO port - in common with all the other PIC Micros you can change the port direction at any time using a TRIS keyword (which is just another register location). Setting a bit in the TRISIO register to zero sets the pin direction to an output. Here all bits are zero so all GPIO bits are set as outputs. As you can see main() is a very simple easily readable program the only slightly non obvious part is the (1<<4) statement. This just takes the value 1 and bit shifts it left four times so the number 4 is the same as bit position 4. Bits in a byte are labeled 7 to 0 from left to right and (1<<0)=1, (1<<1)=2, (1<<2)=4, (1<<3)=8 etc. so this gives an easy way of setting an individual bit in a byte that is also easy to read. If you wanted to set bit 5 you could write GPIO = 32; (or 0x20 in hex) but GPIO = (1<<5) is much easier to read. Note: The C programming course has more on PORT control techniques. Try changing the delay time (in both delay_ms statements) to a smaller or larger value and re-compile and re-flash the chip to see the effect.